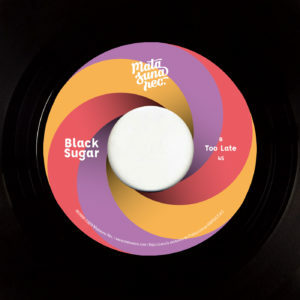 Matasuna Records is delighted to present another highlight with its new release: the first ever official reissue of the 7inch „Viajecito/Too Late“ by Peruvian band Black Sugar. Originally released in 1971, the single is one of the most in demand Latin American 45s. So it isn’t surprising that nowadays 7inches in good condition are extremly rare and only available for several hundred dollars. 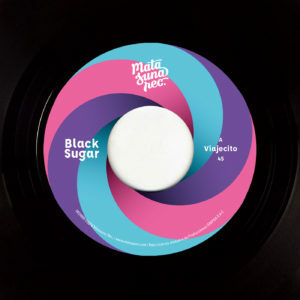 Viajecito opens the single and surprises with his varied composition: guitar riffs meet strange vocal/animal sounds and create a psychedelic atmosphere. With introduction of the bassline, the piano and the rhythm section, the track moves away from this mood. When the horns start to play and the vocals appear, the track gets another turn and takes the listener on „a little journey“. Excellent Latin Jazz track that makes you want more! Too Late is one of the biggest tunes of the Northern Soul scene and also one of the most sought after vinyl. Listening to it reveals why: the piano and the brass create an extremely intoxicating melody – perfectly accompanied by a great rhythm combo, which is pushed further and further by the singer. For sure one of the best Latinsoul songs and a bomb for every dancefloor!